Before living in Latin America, I could probably count the number of times I’d drunk tea on purpose on my two hands. Sure, there were the back-from-India chai preparations in the 80s and 90s, but the way we made it, it was practically hot chocolate, creamy and frothy. I should say, I’ve never been to India, but a college friend of mine’s mother is from India, and she spent time in India and Bangladesh and was probably responsible for me trying chai at least the first time. Unrelated note: she was also there the first time I tried and disliked mango. But tastes change, because now I love mango, so it’s not totally unrelated! So getting back to tea. 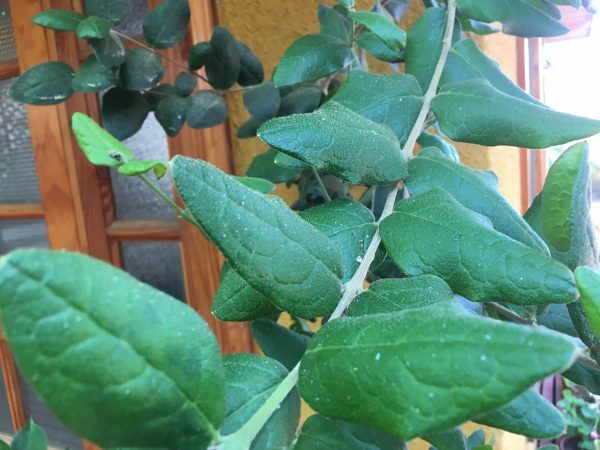 When I lived in Cuenca, Ecuador, there was often a post-meal brew, usually a pot of lemon-yellow water which was cedrón (a kind of verbena) leaves steeped in water. It looked and tasted approximately like Joy dishwashing liquid (or maybe Dawn? ), but I accepted it on occasion, and grew to not dislike it. In Chile, people drink tea often in the morning (though coffee or Nescafé) may also appear, and again in the evening at the meal we call once (kind of an evening tea). But I am a delicate flower on the caffeine front. If I am expected to sleep in the hours post once, then I’d better stick to something herbal. Chile has a selection of herbal teas, some of which may be familiar to you: manzanilla (chamomile), menta (mint), anís (fennel), etc. Then there are some I hadn’t seen before, including llantén (plantain, maybe the leaf? ), etc. 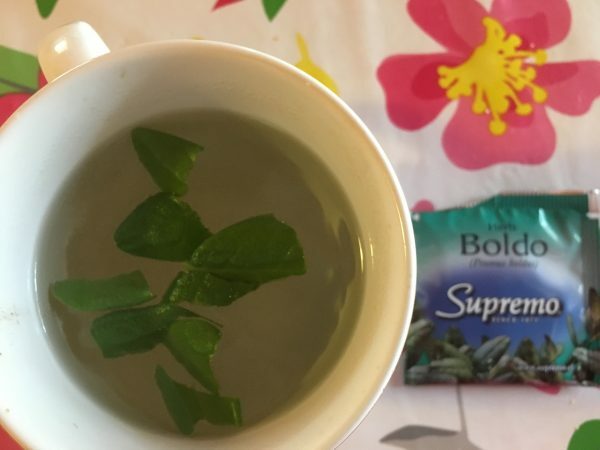 Hey, I even wrote about herbal teas in Chile some years ago, where I reported the formerly litterbox-tasting boldo as being tolerable. And now for more boldo talk. Fast forward to this weekend, and I was at a friend’s beach house. (Video of his hands making pastel de choclo hopefully forthcoming.). It was once time, and everyone was drinking their favorite brebaje (brew), when I reached for a boldo tea bag. And he said, oh, there’s boldo growing outside, why don’t you get some? And while dried boldo makes better infusions than fresh, the leaves are superior to the tea bag. So I plucked off a few leaves and let them steep. This is obviously from the next day, as at nighttime, the boldo, like all of us, were mainly in the dark. And there was the flavor I have come to not only tolerate, but even enjoy. It’s got the grassy menthol of a New England pine forest, the piney coziness of a fresh cut Christmas tree without any of the cloves and cinnamon and long-burning, red candles that make your whole house smell like a spice cookie. And yet, it’s a flavor unlike any other, and I find myself thinking of what else I could put it in. Maybe make a syrup and use it to flavor seltzer? Maybe infuse it in cream to make ice cream? What about a scent for a shampoo or cleaning product? Like Pinesol, but less aggressive. Boldosol? With all the foreign flavors breaking through into the Chilean market of late, including piles of turmeric being sold on the street, and the tropical fruits that come in overland and the nearly retro obsession with truffle oil (which we all know is not really truffle oil), it would be nice to see some traditional Chilean flavors making their way back onto our tables and whantot. And if I can learn to love boldo, which I formerly thought shared something with the smell of cat urine, then surely there’s an international market for it, too. Though after this blog post, I doubt I’ll be asked to write the marketing copy.